Attracting People to Appleby and Eden Valley. Appleby and its surrounding villages are brimming with natural and historic interest. Its community of businesses and organisations host a wealth of interesting and varied activities. While it's not difficult to track down Eden Valley's places of beauty it is less than obvious what's going on in the community, both for its residents and visitors. One of the criteria people consider when visiting or settling in a region is the vibrancy and variety of its community and entertainment. If the valley doesn't make its attractions and events easy to find we risk other destinations taking the lion's share of visitors and new residents and the prosperity they could bring. What follows are the components of a digital strategy for Eden Valley, its towns and villages that address these issues. It's not easy to gather an audience to which you can market your products or events. Very few businesses and organisations will be able to gather and hold an audience on their own. However, by combining our individual contributions we can create an interesting package of content to attract an audience we can all share. Use Twitter as part of a content distribution strategy, Facebook for broadcasting content and Google for explicit searches to publicise your business and events. This website uses Twitter and Facebook to capture events for publication but we rely on you communicating them correctly using Twitter #tags and Facebook event geographic locations. Tweet at least three weeks before the event so that Google has the opportunity to distribute your event. If you are creating public Facebook Events make sure you use their drop-down list of locations, e.g.. type "Appleby, Cumbria" in the event's location field and then select "Appleby, Cumbria, United Kingdom" from the drop-down list. Doing this means Facebook can, and will, push your event for FREE to the 70,000 Facebook users who live within 35 miles of Appleby. Create your Facebook event at least three weeks before the event so that infrequent Facebook users have the opportunity to find your event. If you have a website use Facebook share buttons and communicate page content via Open Graph commands. Please write to editor@appleby-in-westmorland.org to request a FREE introduction to Open Graph and other social media techniques. 3. Don't use graphic posters in your website to communicate content. Google cannot index it. These techniques are too complex to discuss here. Please write to editor@appleby-in-westmorland.org to request a FREE introduction to them. If you run a shop, cafe, service company or local organisation, then a picture representing your business is fed randomly into the right-hand column of articles on this website. The picture is linked to your web space i.e. your website, social media site or an article about your business. As we publish more and more articles about Appleby and Eden Valley your business will be seen by more and more people, hopefully bringing them face to face with you. Below is a random selection of pictures representing some of Appleby's local organisations. Click one of these and it will take you to the organisation's web space. Marketing is about reaching out to new customers, gradually getting into their heads so when they need the thing you sell it's your business they think of. One of the ways to do this is write about your product in a knowledgeable and engaging way. The town's website can help with that by publishing articles you write. Articles (advertorials) like, 'The 10 best ways to...' are popular. Keep the title of your event short e.g. "Garden Open Day". Ideally the title should be no longer than 25 characters, including spaces. This is because the text of the title may eventually appear in google as a live 'Rich Snippets' link. If the title is too long then it will be cut down to 25 characters. The location of the event e.g. 27 Bongate, Appleby. Twitter provides 280 characters but for some events this might not be enough space, so include a link to a web page or Facebook event. Use the hashtag #westmorlandevents so this website's editor and others can find your event. Tweet your events with a large square image using #westmorlandevents in this format so your Tweet appears directly on partner websites across Eden Valley. It's better for your business or organisation if readers see your tweet with your logo rather than @applebycumbria's. We can only use your tweet in the collection distributed to hotels and B&Bs if you tweet using the same professional style the town tweets with. Tweeting an A4 type poster designed to be read on a notice board is not an effective way to communicate to people using a smartphone. The content of a graphic poster can't be read easily on a phone and it can't be indexed by search engines like Google. Tweet with a large (900px) square image representing the event. Generally it is MUCH better if the image does not contain text unless it's large, bright and bold (see left). A lot of text on top of a photographic image is difficult to read on a phone. If you tweet using the same style as the town's tweets, with icons to represent date, time, place, price, link, telephone etc. then we will use your tweet directly in the events calendar. This means it will appear on the valley's partner hotel and B&B websites. Using icons as we do gives you more space for your message saving you from using words and phrases like "call", "tickets available at", "held in" etc. all of which will cost you an extra 30+ characters out of the 280 available to get your message across. At the moment visitors to most Hotel and B&B websites will find "Things to do" and "What's on" pages looking out-of-date, sparse or uninviting. This website maintains the largest collection of events in Appleby and Eden Valley, typically about 150 of them. The collection is always up-to-date with new events added on a daily basis. 1. Appleby's Events Page ranks No.1 in Google. 2. The event tweet will appear on partner websites around the valley. Appleby's Events Collection is easily displayed in any website using a single line of code. 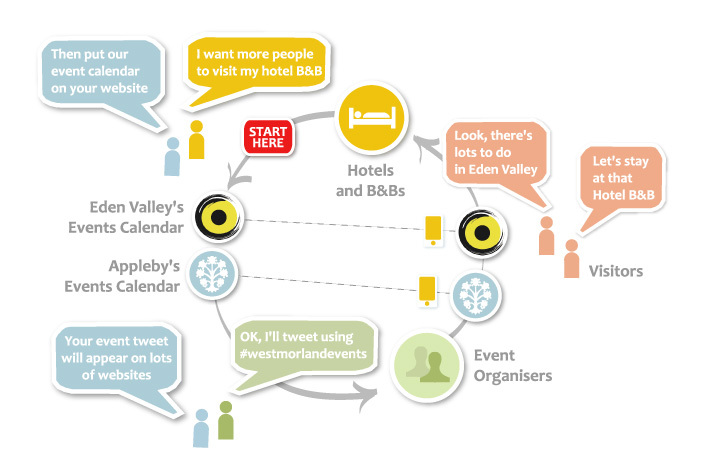 The more Hotels and B&Bs that include the calendar, the more attractive it is for event holders to tweet using #westmorlandevents knowing their event tweet will be seen on many websites across the valley. It's a positive reinforcing circle of benefits (illustrated below), but only if Hotels and B&Bs add the calendar to their website. Please persuade valley Hotel and B&B owners to add the calendar to their websites. They can get the one line of code needed to display Appleby's Event Calendar here. An event calendar is also available for Eden Valley covering the area defined by three 10 mile circles around the valley's three towns, namely Penrith, Appleby and Kirkby Stephen. The Eden Valley Calendar differs from the Appleby Calendar by excluding smaller events meant for locals, like village hall coffee mornings and gardening club member events. Hotels and B&Bs may consider the Eden Valley Calendar to be more suitable for their visitors. The code for Eden Valley's Events Calendar is available here. Which ever calendar you choose, it's a win-win-win situation. Hotels present a vibrant valley with lots to do. Event holders get more people to their events and Appleby, and its villages, attract more visitors and prosperity. You can see what the Appleby calendar looks like on 48 Boroughgate B&B. The graphic below represents the events distribution strategy. It has hot-spots taking you to the live implementation of these services. Traders (that's shops, restaurants, cafes, galleries and market stall holders) can all tweet a message about some aspect of their business using the hashtag #shopappleby. The tweets are curated by this website and fed on to this website's home page, shop and cafe pages. The same collection of tweets will be promoted via QRCodes in shop windows together with the QRCode for valley's events. Traders are assigned a day on which to tweet to ensure a steady stream representing 'The High Street'. Traders should try to keep to the assigned day and not use #shopappleby more than once per week. Traders must tweet from their branded Twitter account, not their private account. Tweet using one large landscape rather than a portrait picture. More than one picture does not display well. The tweet is NOT intended to communicate an 'offer' although making the occasional offer is OK. The tweet should not contain more than one other hashtag e.g. #shopappleby and #visitcumbria. Hashtags are only of any value if they are used as part of a campaign, as in #shopappleby, or if the hashtag is already popular, as in #visitcumbria. For a list of popular business hashtags see Hashtags For Likes. We aren't all accomplished photographers. Thankfully you can find licence free pictures via google, ones that have been "labelled for reuse", as in this search for flowers. The owners of these pictures have already given you permission to use them for your business. This website isn't just a website. It's a strategy. A collection of tactics and services to bring people together, providing them with access to information, capturing their experiences, sharing their views and feeding them with relevant, useful and interesting content. It's a reflection of what goes on in the real world, but bringing all that activity together in one place so residents and visitors alike can see how vibrant a community Appleby and it's surrounding villages are. Below is an interactive graphic that represents most of the components of this website and its supporting social media. Each of the eight components is discussed here, including the flows of information between them. Collectively these feed content to 'The Public'. An explanation for each part is given below. You can move your cursor around the graphic looking for hot-spots that will, with a click, take you to the live content it represents. This is the Town's Facebook Page where content (articles) from residents, traders and local organisations are shared with followers of the page. A Facebook page is often the first taste of content someone will discover. It is one of the ways 'The Public' will discover the content available on the website, the other being searches via google or notices in traders shop windows advertising via QR Codes. Partner organisations give a commitment to provide regular content. In this example it's pictures of old Appleby published in the town's Facebook Group at No.4. The group posts are indexed on this website so they can be searched based on some criteria. In this case the picture's 'decade' and 'location'. The town's Facebook group allows residents, and visitors if they would like to join, the opportunity to discuss local issues or share pictures of the valley etc but also to receive notices from the administrators about upcoming events. It also acts as a help service and as such has already reunited lost family members. Traders, i.e. shops, cafes & pubs, can tweet with #shopappleby collectively creating a stream of content that 'The Public' can use to find out what's available on Appleby's High Street. These tweets are filtered at No.6.1 providing content for twitter and non-twitter users alike on the town's website. The tweets using #westmorlandevents and #shopappleby are curated by the town's twitter account. Curating the tweets from the town's traders and local organisations prevents spurious content being driven to the town's website. As part of this strategy the town's shop windows will display QR Codes linked to the twitter collections of event organisers #westmorlandevents and traders #shopappleby. This is the collection of users that host events. It includes local organisations, businesses, traders and artisans e.g. Appleby's Remote Cinema and the Eden Valley Trust who use #westmorlandevents to get their events included in the town's calendar. The collection of event tweets at No.6.2 can be embedded into any other website. This allows B&Bs and Hotels to include Appleby's events in their websites so prospective visitors can see what's going on in the valley. This means that when an organisation tweets an event with #westmorlandevents the notice appears on many websites across the valley such as The Barn at Well Green in Great Asby. 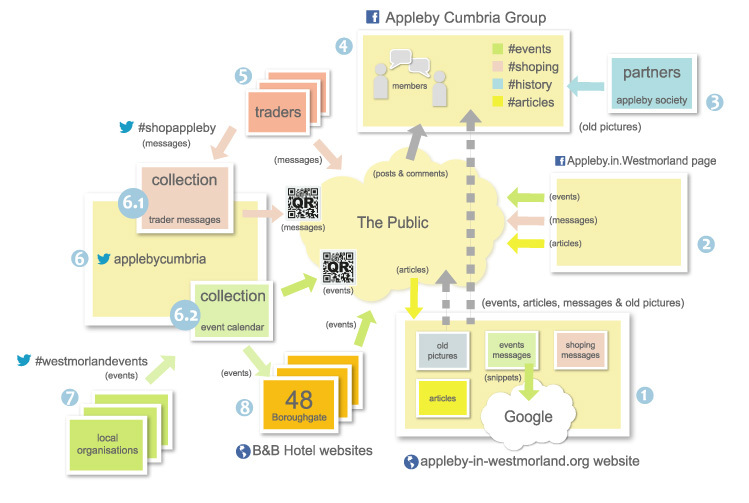 The contents of Appleby's digital strategy (above) is represented by the bubble 'A' below. Similar digital strategies can be implemented for Penrith 'B' and Kirkby Stephen 'C', defined by a 10 mile radius around each. The common thread for these is the online magazine Eden Valley Eye and its Facebook group I Love Eden Valley (launched 4th March 2019). 'I Love Eden Valley'' provides a place for residents and visitors to share their pictures of the valley. Importantly tourists can ask residents for recommendations for activities, events, accommodation and walks etc. The full geographic reach of the three settlements is shown here. They collectively cover Eden Valley to the northern limit of Eden District, including the eastern edge of the Lakes. Each settlement's events calendar will include small local events within their 10 mile scope. Eden Valley's events calendar will only publicise the major events within the scope of all three settlements. 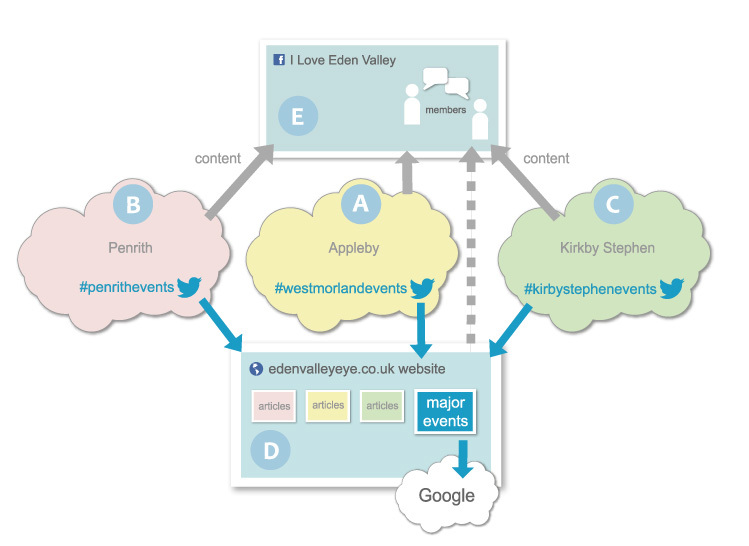 Where possible Eden Valley Eye will include events shared via Twitter by the three settlements using their respective hashtags, namely #westmorlandevents (Appleby), #penrithevents and #kirkbystephenevents. Eden Valley Eye will write articles about the Good Life, Town Life and Country Life within the scope of Eden Valley and its settlements, sharing them in the group 'I Love Eden Valley' and offering articles to the national press. The name of the valley's group, 'I Love Eden Valley', has been chosen to mirror the very popular 114,000+ members Lake District Facebook group called I Love The Lake District. I hope our combined efforts expressed through a collection of content rich websites and social media venues opens up communication between you, residents and visitors to Eden Valley. The digital strategy's goal is to get more people to visit Eden Valley and its towns, spend money and come back for more. Take a good look around this website and if you have any ideas or need any help then feel free to contact me.